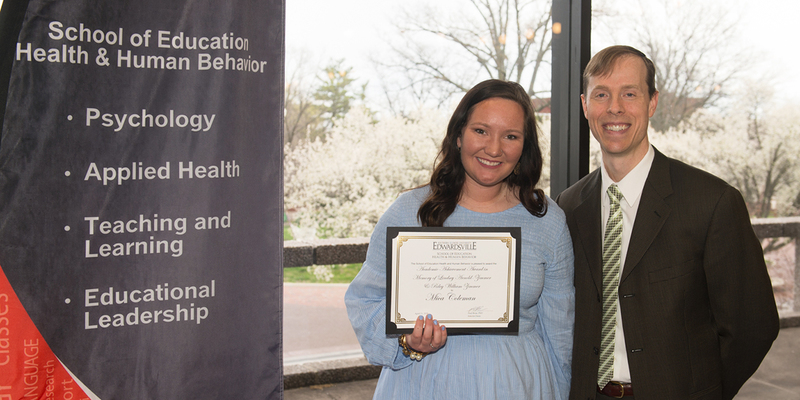 Dr. Meder Sauerwein joined the faculty of the Speech-Language Pathology and Audiology program at SIUE in 2018. She is a certified speech-language pathologist and has worked in a variety of clinical settings. Dr. Meder Sauerwein teaches undergraduate and graduate coursework in augmentative and alternative communication and pediatric speech and language disorders. She has presented at professional meetings at state, national, and interventional levels and is an active member in the International Society for the Scholarship of Teaching and Learning. Dr. Meder Sauerwein’s research interests address the gaps in preservice education in augmentative and alternative communication (AAC) for speech-language pathologists. She uses qualitative methods to explore the novice-expert gap in AAC service provision. Her scholarship of teaching and learning informs the development and redesign of coursework and clinical practica for undergraduate and graduate students studying speech-language pathology. Meder, A. M., & Wegner, J. R. (2015). iPads, mobile technologies, and communication applications: A survey of family wants, needs, and preferences. Augmentative and Alternative Communication, 31(1), 27-36. Meder, A.M. (2017, November). Incorporating Case-Based Learning in Undergraduate Coursework. Flash session presented at the American Speech-Language-Hearing Association Convention, Los Angeles, CA. Meder, A.M. (2017, November). Preservice Preparation in Augmentative and Alternative Communication: A Review of Outcomes. Poster session presented at the American Speech-Language-Hearing Association Convention, Los Angeles, CA. Meder, A.M. (2017, October). Adventures in Assessment: Evaluating Student Learning in Speech-Language Pathology Clinical Practica. Poster session presented at the International Society for the Scholarship of Teaching and Learning Conference, Calgary, Alberta, Canada. Scharff, L., Friberg, J.C., Hamshire, C., Ahmad, A., & Meder, A.M. (2017, October). Advocacy and Outreach: Addressing Issues of our Times. Panel session presented at the International Society for the Scholarship of Teaching and Learning Conference, Calgary, Alberta, Canada. Meder, A.M., Meehan, S., Wegner, J.R., & Gillispie, W.M. (2016, November). Building a Telepractice Program: Development, Implementation, and Outcomes. Poster session presented at the American Speech-Language-Hearing Association Convention, Philadelphia, PA.
Meder, A.M., & Wegner, J.R. (2015, July). Augmentative and Alternative Communication Professional Development for School-Based Personnel. Poster session presented at the American Speech-Language-Hearing Association Schools Conference, Phoenix, AZ.